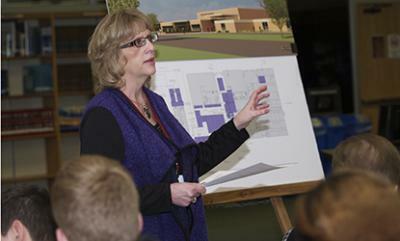 Glencoe-Silver Lake Public Schools hosted one of its community school luncheons Thursday. This month’s feature was the STEM (science, technology, engineering and math) and Project Lead the Way, which focuses on developing practical skills in each of those areas in students. Above, program coordinator Heather Peirce talks about how the program is being applied in the Lincoln Elementary School.